This Mediterranean garden design could be summed up in one word - simplicity, proving that a garden does not have to be complex to be stunning. Roma combines the beauty of symmetry with the power of perfection to create a breathtaking masterpiece. Order Today to Secure your 50% Discount! The planting is typical of that of a formal design. As your guests arrive they will be amazed at the beauty of simplicity. As you walk through the back garden the roman pillars greet you with their bold features. In front there is a stone statue placed beneath an arched hedge with a mirror behind it. On either side the benches await you under an arbor planted with ivy, before them stand large concrete pots with trees in them gently inviting you in. 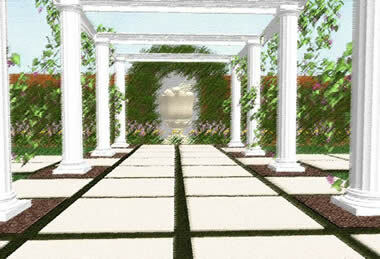 This Mediterranean garden plan is shipped on a CD and DVD. 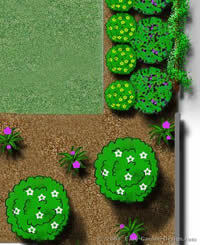 The CD which contains a full high resolution garden plan,complete product key and plant list. A description of the garden includes photos and/or artist impressions to help with the landscaping. 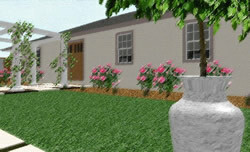 A DVD with walk through video clips and narration explains details of the garden design. The bonuses as described below simplify the adaptation of the design to your garden needs and provide information for the correct installation of the Mediterranean garden design. Garden Customization Instruction Manual This manual provides step by step instructions to assist the reader in customizing the mediterranean garden design to their specific requirements and home. You are guided through all the essential elements of the design so that the original professional design features will be preserved and transferable to your garden. Garden Installation Instruction Manual This instruction manual explains all the steps required to translate the garden plan into a landscaped garden. Instructions include amongst others, preparation of the soil, garden layout, hard landscaping, planting of trees shrubs and other plants. Special tips and techniques are required to transform a professional garden design into a award winning show garden. These techniques are also provided in this manual. We have taken the utmost care to provide this unique product and are confident that the Roma Mediterranean Garden Design will	live up to your expectations. The only thing we ask is that you return the DVDs, CDs and Certificates that we shipped to you within 4 weeks	of your purchase. PS: I am absolutely sure that you will not find a better solution to DIY Professional Landscaping anywhere else. I and my design team have spent many hours putting this mediterranean garden design package together and will give you the necessary support to make your garden a success.